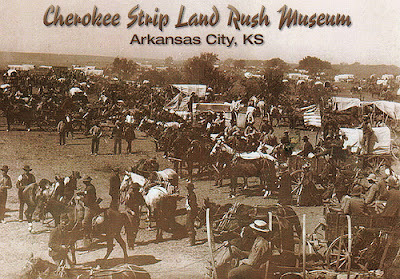 One of the great moments in American History was the opening of the Cherokee Strip in Oklahoma Territory, which had been purchased from the Cherokees’ in Indian Territory. The strip was 226 miles east to west and 58 miles north to south. Parts of the strip were opened for settlers at different times and the biggest event was the race for land in 1893 where the contestants for the were allowed to claim a quarter section (160 acres). On the day of the run there were 100,000 people in Arkansas City the main starting point; three days later only 5,000 were still there. A hundred and fifteen thousand individuals registered for the run, but friends and relatives came along so as many as 150,000 made the run racing for the 42,000 claims. The land parcels were handled like homesteads and the winner had to be a citizen to get a patent for the land. Since Native Americans were not citizens they were not allowed in the race. The name Sooners for Oklahomans comes from people who found ways to get claims before the official race began. Many cities and towns grew out of this the largest competitive event in history. Our first stop in exploring the Cherokee Strip was Arkansas City, Kansas where the Cherokee Strip Run began for most people, others started at smaller starting gates including one in Perry, Oklahoma that also has a museum. The museum in Arkansas City is small, and the building it is in was originally a bowling alley. It is obvious they need money and are working to make improvements in their displays. The staff has hopes of making the museum a major tourist stop and they are running various programs to raise the necessary money. At the time of the land rush the United States was in an economic depression with 18 percent unemployment. Pressure was on the government to do something to provide opportunities for those who were unemployed. The open land was seen as a chance for many people to start over and for others to get rich. Contestants set off to claim land on horse back, in buggies, in covered wagons, on bicycles and some even on foot. Many were not well prepared and water and food was often in short supply. At the museum in Perry the story is told of Truman Daily of the Otoe-Missouria tribe who provided water and food for the rushers who seemingly had not taken into account their need for either in their haste to claim the land. People died in the rush, no numbers are given, but the indications are that some killed others in arguments over who had the right to the land. Equipment on display in Arkansas City from the run includes buggies, wagons and various kinds of farm equipment. Besides covering the Cherokee Strip Run the museum has material on the history of Arkansas City, a stage and dressing rooms for plays, and on the outside of the building a one room school, a small rough looking jail and a Cherokee fort. The fort is made of large branches and the house made of straw. It looked like it would be dangerous if you tried to make a fire in it. Close by was an Indian Industrial School of 8,640 acres that was intended to civilize Indians by training them in white mans’ ways. While at the school Native Americans were not allowed to speak their own language, had to wear white man’s clothes and learn to make a living doing white man’s jobs. Runaways were frequent. On the other hand it did give students some skills for living in the new world that replaced the one they had lost. Oklahoma’s Cherokee Strip Museum in Perry is a small building constructed from local stone and looks like it was intended to be a museum. Much of its charm of its exhibits is based on the use of old pictures coupled with personal reminiscences. The first panel is mammoth bones and flint points of the early Indians in the area. Then we learn about the Cherokees who always seem to get taken advantage of by the whites. They’re given land; they follow the rules, turn into Americans and then lose their land. We also learned about the Osage and a group I didn’t know about previously the Otoe-Missouria who came from Michigan. A set of their relics, beads and clothes are on display. Next we were shown how cattle men used the Cherokee Strip to fatten their cattle before moving them up to the railroads in Kansas. There is a display of tools of the period. This museum does a lot with little by making good choices and presenting background to let the visitor know what was happening. In the run of 93 there were Sooners who managed to get on the land early and claim choice spots. Towns grew up overnight because besides claiming homesteads people could claim plots in the future towns. experience a day of 1905 school. Rooms of the period have been created and furnished. A back porch, dental office, living room with musical instruments, general store, dress shop, doctor’s office, kitchen, sheriff’s weapons, and in the reception room various samples of furniture—desks, book cases of the period. The big treat of the day for us was the fourth grade children who were bused in. They came wearing clothes like those in 1910, and carrying old fashion lunch pails with simple foods of the time. Their teachers were also dressed in period clothes. Next to the museum is a one room school house that regularly brings fourth graders in to experience a day in a one room school as it was run in 1910. The teacher had the discipline of the period down to its fine points. The boys and girls stood in separate lines, and marched into the room in order. They stowed their food and coats in the anti room, carefully seated two to a desk, given instructions on their behavior: including how to get permission to use the outdoor toilet. We watched their penmanship class that included instructions on to use the inkwell, the old fashioned pen. Many were having trouble managing it. Later they were to get instruction from the McDuffie Reader and have a spelling bee. We were told by the docent that the children really like this experience. We also stopped in Guthrie to visit their history museum that has many original objects, lots of personal accounts of life in the pioneer days and many items from the actual land rush. The museum also spends time on the five different occasions when land was made available. On the second floor is an account of more recent history especially the story of how the capital was stolen from Guthrie, the original capital and taken to Oklahoma City. Despite the professional layout and presentations we found the displays difficult to read and see because they kept everything so dark. At the Perry Museum old farming equipment of the period is on display. Its very helpful, i have read and bookmark this site and will recommend it to more other peoples.